Raymond Xuereb donning the national team's shirt. Raymond Xuereb is one of the most important Maltese players of the modern era. A look at his record should be enough to support this statement. His career is one of the longest and most successful in the history of our game. Born in Marsa on September 22, 1952, he is the brother of Francis, who had a long career with Floriana and Hibernians, and George, whose career followed closely that of his brother. A product of Floriana FC's youth scheme, Raymond Xuereb played 178 league games and scored 80 goals for the Greens before he moved to Ħamrun Spartans, Naxxar Lions, Għargħur and Qrendi. Xuereb made his league debut for Floriana on February 23, 1969 against Valletta, coming on as a substitute for Charles Buttigieg. From then on, he never looked back, going on to win four league championship and three FA Trophy medals for Floriana before he joined the Spartans in 1982. Xuereb enjoyed a remarkable season in 1976/77. He led Floriana to the championship, finished as the league's top scorer and won the coveted Footballer of the Year award. Late in the season, Newcastle United came to play in Malta. The English league club were impressed by the elegant but forceful play of the Maltese striker and promptly declared their interest in Xuereb. Newcastle manager Richard Denise invited Xuereb for a trial. During his stay in Newcastle, he played a number of matches in the Central League. In the meantime, Denise left the club and Lou Macari took over. This complicated matters for Xuereb but he still left a good impression on the new manager. Unfortunately, he suffered a rather serious injury and was forced to return to Floriana. 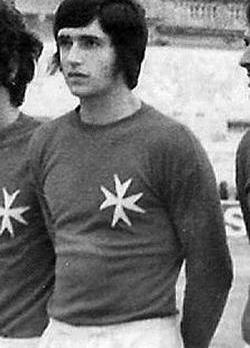 Xuereb made his international debut on October 15, 1972 in the World Cup encounter against Sweden. In all, he scored six goals in 44 international appearances for Malta. In 1982-83, Ħamrun Spartans, led by the late Victor Tedesco, were making a fresh bid to revive the club's fortunes. Old 'maestro' Tedesco, realising that he had to delve into the transfer market if he was to succeed in his bid, made a successful move to take Xuereb to Ħamrun. When Xuereb joined the Spartans, many predicted that this would be the end of the road for him. However, nothing could have been further from the truth. With the Spartans, Xuereb found a new lease of life, winning another league championship and an FA Trophy medal before moving to Naxxar Lions midway through the 1985-86 season. In his first season with Naxxar, Xuereb won the Third Division championship, the Second and Third Division Cup, and the Third Division Player of the Year award. The next season he helped the Lions to win the Second Division title and in 1987-88 he led the club to the First Division championship and a place in the Premier League for the first time. Always seeking new ground to conquer, Xuereb, 37, joined Għargħur in the Second Division in 1989-90 helping them to win the championship the next season. Another short stay at Naxxar followed during which he won another Division One championship medal. In 1993-94, although in the twilight of a long and glorious career, Xuereb was really enjoying his football. Naxxar were marching towards another promotion and he was playing better than ever. Then, like a bolt from the blue, disaster struck. An injury in the game against Marsa and a one-year suspension by the MFA for taking part in the MAFA League, seemed to have put an end to Xuereb's career. The 'old fox' was down but not out yet. In 1994-95, he made a comeback with Naxxar in the Premier League. Time was by now catching up with him but Xuereb was determined to go out with a flourish. In 1995-96, he joined Qrendi, leading the modest club to the Third Division title and finishing once again as the league's top scorer with 16 goals from 12 matches. It was a fitting end to the career of one of the greatest goalscorers in the history of Maltese football.